Ronald Ernest "Ron" Paul (born August 20, 1935) is an American Libertarian. He was formerly a Congressman from the state of Texas. He is retired but still travels around giving speeches about his beliefs. He tried to become President of the United States in 1988, 2008, and 2012 but he was defeated all three times. He has called himself a lifetime member of the Libertarian Party. He is for reducing or removing most taxes and removing many government rules about how people may live and spend their money. He does not want the United States military going into or attacking other countries, but instead wants it to only stop others from attacking the United States. He also believes that the United States currency should not be controlled by the Federal Reserve, which is the central bank of the United States. He wants people to be allowed to use any currency they want when buying and selling. His son Rand Paul is a U.S. Senator. ↑ "Ron Paul Background". Pew Forum on Religion and Public Life: Religion & Politics '08. Pew Research Center. September 2007. Retrieved 2007-10-21. ↑ Staff (5 December 2011). "LP Monday Message: 10 Ron Paul questions". 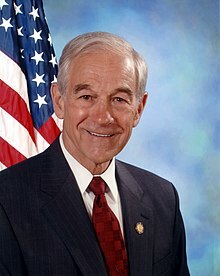 Wikimedia Commons has media related to Ron Paul.